Here in Northern California, spring is officially sprung. (Apologies to my readers in other, colder, parts of the country). For the first time in my life, I have a whole garden to play with, and this has me pouring over Better Homes & Gardens, Sunset magazine and Country Living for hours. I want a space that's pretty to look at, of course, but productive, too. It's my four year old son who requested the vegetables. We spent part of the winter reading Laura Ingalls Wilder's Farmer Boy, and it's made him keen to try growing his own food. Good news is that it's very possible to have a garden that's lush with both flowers and vegetables. In fact, flowers help to attract pollinators, which benefit your vegetables, too, and some flowers also ward off pests. So diversifying your plants is a win-win situation. And it's very possible to make it all pretty. You just need to follow some simple design rules, which I'll walk you through. Let's peruse some beautiful edible gardens, shall we? 1. Vary your colors. As one of my grad school teachers was fond of saying: contrast equals interest. So mix up your palette when planning your garden. The purple of this lavender works so well with the red of the scarlet runner beans and the yellow on the stems of chard. Combine those colors with a heady dose of green, and you end up with a very pretty sight indeed. 2. Plant in groups. Notice how many peppers and cabbages are growing next to each other here. That gives them a lot more visual punch than if they were spread out one by one. 3. Vary your heights. Plant lower crops in front, and higher ones in back. This is important not only from a visual standpoint, but a practical one, too: it ensures that all your plants get enough sun to grow. 4. Use pretty structures to trellis your plants. Don't limit yourself to boring metal tomato cages. You can easily fashion your own teepees using twine and bamboo stakes. 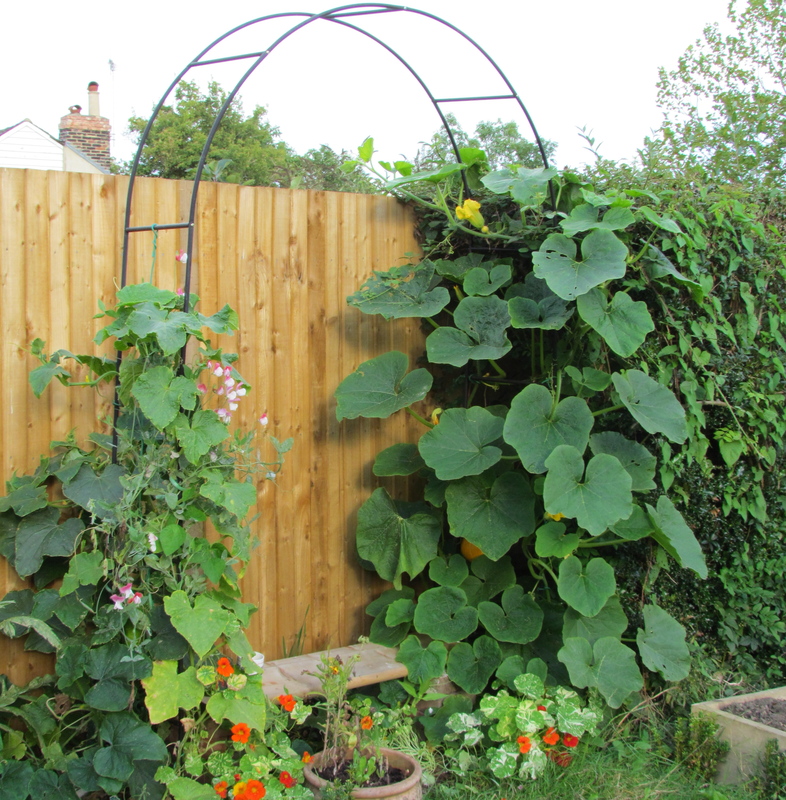 Or try an archway for a particularly vigorous trailing plant, like squash, beans or cucumbers. These structures will give your garden architectural interest, and height variety, too. 5. Consider your layout. These types of gardens cry out for variance in pattern, not straight rows. And be sure to pay attention to how closely you plant the seedlings. You want them to create a dense, lush landscape, but not be so close that they choke each other to death. So why not make the most of the warm weather? Follow these steps, and you'll end up with a garden that brings you both joy and sustenance for months to come.